There is one big lesson from the Danske Bank money laundering scandal. Regulating the modern banking system does not work. Modern banks are now primarily giant hedge fund managers speculating on financial assets or they are conduits for tax avoidance havens for the top 1% and the multi-nationals. The Danske Bank scandal is the latest and largest example of these modern banking activities. Over $235bn in ‘special transactions’ flowed through the bank’s tiny Estonian branch in just four years from 2012 – an amount that dwarfs the Baltic nation’s GDP. And this was in the period when international bank regulation had been tightened up, according to the IMF and the Bank for International Settlements, after the ‘reckless’ behaviour before the global financial crash. Indeed, it was probably not just Danske Bank, but according to the Estonian central bank, the supposed regulator, Estonian banks handled about 900 billion euros, or $1.04 trillion in cross-border transactions between 2008 and 2015. The notion that these foreign individuals and investors would choose to run such a large sum of their money through Estonia for explicitly legitimate purposes is difficult to swallow. After all, this comes after the liquidation of ABLV, formerly the third largest bank in Latvia, after it was caught laundering money for North Korea. John Horan, senior associate at Maze Investigation, Compliance and Training Ltd. in Belfast, says money laundering is a Europe-wide problem. “dark money will almost certainly continue to flow through the European banking system like sand through a sieve.” It’s a never-ending story. Indeed, that’s not all. The very latest scandal concerns the siphoning of over $2bn of Danish tax revenues through a scam involving claiming back tax paid by foreigners on Danish shares. It appears that these foreigners never owned any shares or paid tax on them and yet they were able to get ‘refunds’ through the connivance or negligence of Danish government employees and small European banks shifted the money – and nobody has been charged or resigned over this massive loss of taxpayer money – equivalent to $110bn in US tax revenues. The regulators have been useless in stopping these criminal tax avoidance schemes by the banks. For example, Carol Sergeant was a regulator at the UK Financial Supervisory Authority and headed up supervision of the banks at the Bank of England. She got an honour from the Queen for “services to financial regulation”. She joined Lloyds Bank in 2010 and received bonuses which Lloyds are now asking back as she (among others) presided over the payment protection insurance (PPI) scandal for which Lloyds must pay now £18bn in compensation. But guess where she works now? Yes, it’s as non-executive director of Danske Bank, where her responsibilities include making sure that the bank operated under regulations! Well, it may be true that international banks are better capitalised and less leveraged with bad debts after the gradual implementation of the Basel III capital and liquidity accords and the widespread adoption of ‘stress testing’, but even that can be disputed. In 85% of those 24 countries that experienced the banking crisis in 2007-8, national output growth today remains below its pre-crisis trend. And the IMF admits that “in many countries, systemic risks associated with new forms of shadow banking and market-based finance outside the prudential regulatory perimeter, such as asset managers, may be accumulating and could lead to renewed spillover effects on banks”. The ‘official’ view that regulation is the only way to control the banks is accepted by most Keynesians or those who see the financial sector as the only enemy of labour. Take Nick Shaxson. Shaxson wrote a compelling book Treasure Islands, tax havens and the men who stole the world, that exposed the workings of all the global tax avoidance schemes and how banks promoted tax havens and tax avoidance for their rich clients. Shaxson goes on: “Long ago, our oversized financial sector began turning away from supporting the creation of wealth, and towards extracting it from other parts of the economy. To achieve this, it shapes laws, rules, thinktanks and even our culture so that they support it. The outcomes include lower economic growth, steeper inequality, distorted markets, spreading crime, deeper corruption, the hollowing-out of alternative economic sectors and more.” So what are we to about these criminals at the centre of our economies, according to Shaxson? “We can tax, regulate and police our financial sector as we ought to.” So it’s regulation again – a policy that Danske and other scandals have proven not to work. Stiglitz proposed that future meltdowns could be prevented by empowering incorruptible regulators, who are smart enough to do the right thing. “[E]ffective regulation requires regulators who believe in it,” he wrote. “They should be chosen from among those who might be hurt by a failure of regulation, not from those who benefit from it.” Where can these impartial advisors be found? His answer: “Unions, nongovernmental organizations (NGOs), and universities.” But all the regulatory agencies that failed in 2008 and are failing now are already well staffed with economists boasting credentials of just this sort, yet they still managed to get things wrong. In a 2011 book, Engineering the Financial Crisis: Systemic Risk and the Failure of Regulation, Jeffrey Friedman and Wladimir Kraus contested Stiglitz’s claim that regulations could have prevented the disaster, if implemented by the right people. Friedman and Kraus observe: “Virtually all decision-making personnel at the Federal Reserve, the FDIC, and so on, are . . . university-trained economists.” The authors argue that Stiglitz’s mistake is “consistently to downplay the possibility of human error—that is, to deny that human beings (or at least uncorrupt human beings such as himself) are fallible.” But note that Friedman and Kraus were no better in coming up with a solution. They argued for less regulation – free market style! Kane notes that “top regulators seem to believe that an important part of their job is to convince taxpayers that the next crash can be contained within the financial sector and won’t be allowed to hurt ordinary citizens in the ways that previous crises have.” But “these rosy claims are bullsh*t.” Kane wants criminal bankers locked up, not the banks just fined. Indeed! 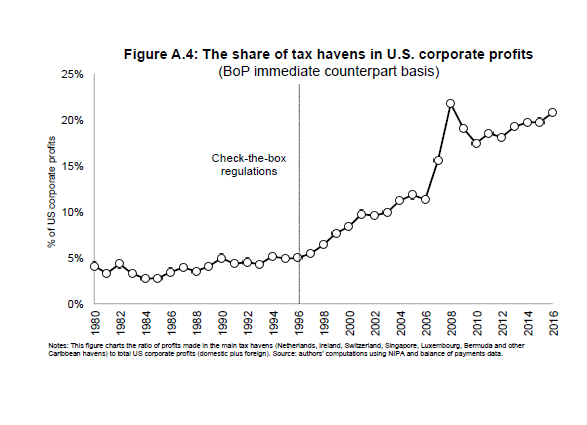 As Gabriel Zucman and Thomas Wright have shown in a meticulous and in-depth analysis of the size and extent of tax havens and tax avoidance, far from them being reduced or controlled, on the contrary, such schemes are an increasing part of US corporate profits, organised and transacted by the banks. 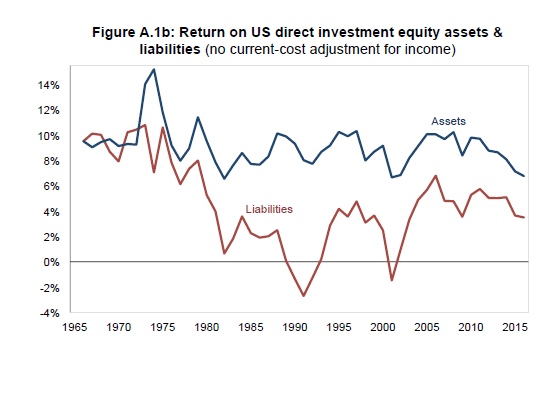 Zucman and Wright also show that the rate of return (or profit) on US multi-national investments abroad has not risen, indeed the rate has slipped. But thanks to favourable tax regimes (including the latest Trump measures) and the availability of tax havens like Ireland, after-tax profitability has jumped. So those who think that ‘regulating’ the banks and tax evasion using ‘regulators’ will work are expecting pigs to rev up their jet engines for flight. I have posted before on Stiglitz’s views as expressed in his book, http://www.amazon.com/Rewriting-Rules-American-Economy-Prosperity/dp/0393254054. “We can’t leave to market forces to solve the problems by themselves”, concluded Stiglitz, so we must rewrite the rules of the game. But he admitted that his rule changes were unlikely to see the light of day. Changing the rules or regulation of the banks won’t work; we need ownership and control. This entry was posted on October 6, 2018 at 3:21 pm and is filed under capitalism, economics, Profitability. You can follow any responses to this entry through the RSS 2.0 feed. You can leave a response, or trackback from your own site. Government, state or public ownership of the banks in the absence of comprehensive social change may reduce but not solve the problem. State-owned corporations can be effectively taken over by premium-seeking managers and, of course, re-privatised. And as Labour will discover when it takes back rail franchises, it will be blamed for every delay and interruption of services (at present, you can blame the franchise holders). What should be nationalised and run on a non-profit basis is the payments infrastructure. At the risk of repeating myself, imposing a rule on all UK incorporated businesses to hold at least half their balance sheets in tangible assets will sharply reduce the incentive to invest in and create intangible assets which can be moved easily to attractive jurisdictions, of which there are hundreds. Does it mean that we can now at least formulate the hypothesis that real existing capitalism has crossed the barrier — save for a new extraordinary fact, of course — where its average profit rate has fallen to such a level real existing tax rates make it negative (i.e. a loss)? Or is it capital simply searching for greater profit rates? Thanks for your putting Danske Bank on the agenda. One little correction: the tax scandal with inventive people getting paid back taxes on dividends on shares they did not own is not of new date. It dates from 2015. Does not make it any better of course. Of the 12 billion kroners ‘refunded’, the trajectory of about two thirds has been uncovered and the culprit identified. Sanjay Shah is hiding in Dubai though and is not being extradited. One reason being that Denmark has no extradition agreement with Dubai. There’s a big flaw in Shaxon’s claim that “Long ago, our oversized financial sector began turning away from supporting the creation of wealth…”. It’s that a bank will lend to absolutely any credit-worthy looking potential borrower that comes thru its door: makes no difference whether it’s a “wealth creator”, a brothel proprietor, or a bog standard mortgagor. If one bank turns down an obviously viable “wealth creator”, e.g. an SME, it knows that another bank will make money by lending to the “wealth creator”.